Relinquish All Writing Fetishes: When Should You Hold Onto Them? In Booklife I have a section on relinquishing all fetishes, which is another way of saying don’t let having to use a fancy pen or special desk get in the way of writing. As I mention in the book I’ve learned to write anywhere at any time, and to never stifle my imagination just because I’m not in the ideal writing situation. I give this advice in the book because we most commonly procrastinate and find reasons not to write. But the fact is some “fetishes” actually aid our creativity. Case in point—the photograph above. On the left is a leather-bound, hand-made writing pad I bought in Victoria on Vancouver Island while on my honeymoon. I’d had it in the closet in my office ever since then, more than seven years. Every time I pulled it out, I put it back in the closet again. The thing just seemed so nice, so opulent, that I couldn’t imagine writing in it. 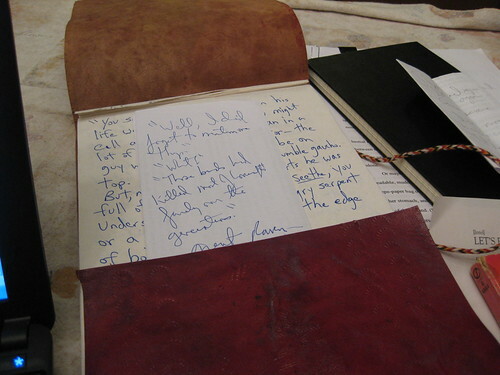 And yet I’d bought it because it was tantalizing–it suggested adventures I’d never write about in any other journal. Well, this past week I finally found the perfect use for it. The paper inside is perfect for writing, but also perfect for art. I’ve started a rather odd story that includes extensive illustrations, and no other writing pad I have gives me the same sensation of effortless motion while both writing and drawing. Even the odd size of it helps, because it better accommodates the art and the words. Suddenly, everything about this impulse purchase that turned me off is helping me get into the groove of writing, energizing me, and recharging my imagination. Meanwhile, next to it in the photograph is a plain black Moleskine notebook. In it, I’ve written several book reviews and a new short story–a very conventional, Southern Gothic-style story. The utilitarian look and feel of the notebook seems to help me keep focused and on task. I could no more write the reviews and the Southern Gothic story in the opulent oversized writing journal as I could create the illustrated strange story in the Moleskine. Each is perfect for its particular purpose. So my question to you, because I’m curious, is: Have you had similar experiences with your writing tools, your writing surfaces, your writing life? This entry was posted in Uncategorized and tagged authors, creativity, imagination, Living Your Booklife, the writing life, writing, writing experience. Bookmark the permalink. I'm a fine artist (who dabbles in writing) and I find your philosophy to be just as helpful when applied to art. Artist's are particularly notorious for fetish, ritual, superstition and dependence when it comes down to the "work" of creating art. But as Hugh MacLeod says "The more talented somebody is, the less they need the props." Of course props can help set a mood and inspire the imagination. I'm quite fond of my props – but fondness and dependence are two very different things. Thanks for the great post! I usually write on a netbook (because it's portable enough to take everywhere, *and* usually affords a free wifi connection which I employ relentlessly for research/fact checking/targeted serendipity; for me, usually more stimulating than distracting, though that's a separate conversation). Sometimes I'll jot tidbits into a small A6-sized paper notebook. But sometimes I'll get stuck, and I've recently discovered my wife's large drawing board. I'll grab it off her easel, put a few sheets of cheap 18×24 newsprint on that, and suddenly I'm free to draw, doodle, mindmap, columnize, and all those other things which a large blank paper space invites; it nearly always helps get me over the hump. Really handy article, I really liked reading through it. It had a number of terrific information and facts. I'm bookmarking this website. What a exciting post you have posted. Good share. But I am having difficulty with this RSS. I could'n to subscribe. Is there any one else experiencing similar issue with your rss?